RT vs the Western "Media"
On Tuesday I was a guest on the episode of CrossTalk about the elections in the Ukraine, which aired today. Three days prior, I chimed in about V. V. Putin's remarks at the Valdai Club forum in Sochi. He identified the Empire-possessed U.S. (and its EU appendage) as the source of instability, violence and chaos in the world. I've said as much myself back in February, so it's no wonder I concur. The Anglosphere media, predictably, did not. For example, the Guardian's obnoxious (and clueless) Shaun Walker described Putin's remarks as "railing" against the West. Good thing the full transcript of the remarks (in English too) is available via the alternate media. Putin did not face many tough questions from the assembled audience. Peter Lavelle, a presenter on the Kremlin’s Russia Today television channel took the opportunity to tell the president that he is “the most popular man in modern history” and in much of the world is “looked upon as a saviour of sorts”. I've addressed here before the whole "RT is Kremlin propaganda" nonsense. Walker is simply trying to disqualify RT and Lavelle with a drive-by ad hominem. Worse, though, in this passage he is lying by omission: Lavelle did say the words quoted above, but as part of a question about the Western media's demonization of Putin. Watch and listen for yourselves. Putin's reply, too, for good measure. Now tell me again why you or anyone else ought to think the Western media is fair, objective, accurate and decent, while "Kremlin's Russia Today" is nothing but evil lies and propaganda. Rubbish. My first first column at Antiwar.com was published October 19, 2000. That's fourteen years ago. Even I forgot about the exact date, thinking it had been sometime in November. "Balkan Express", as it was called, had 269 editions - more or less once a week. In 2007, we changed the name to "Moments of Transition", and the publication schedule to every other week. The latest column, "Two Parades and A Drone", was published this past Saturday. It was the 460th column for Antiwar.com that I have written over the past fourteen years. Saturday was my debut as a columnist for RT's Op-Edge. The piece - "Ukraine's election: Behind the looking glass" - analyzed the background and possible outcomes of the ritual taking place in junta-controlled territories today. Looks like both the editors and the readers liked it, so look to more pieces from me over at Op-Edge soon. I almost can't believe I've done all this, and plan to do more still. The very notion sounded surreal back in 1999, when I penned the first commentary in response to mainstream media rubbish concerning Kosovo, and had it published online. Yet here I am, fifteen years later, still standing. Still writing. Still flying. Anglosphere Media Spin: "A Small Drone Stunt"
Three days after the drone incident at the Serbia-Albania game in Belgrade, the propaganda in the mainstream Anglosphere media is getting worse. That should not come as a surprise: for the Empire's lie machine, anything goes when dealing with the Serbs - from simple spin and subterfuge to outright making up one's own "facts." Video of the event showed some Serbian spectators — Albanian fans were barred from the stadium — shouting “Kill! Kill! Kill!” Others ran onto the field, attacking Albanian players, sometimes with chairs, and forcing the Albanian team to escape through a tunnel at the end of the field. Per Bilefsky (or his editors), it all started when "a small drone trailing a nationalist Albanian flag" flew into the stadium. At this point, I would like to refer you to an outright brilliant analysis by the good folks at eBritic, who not only surveyed the British media's distortions of Tuesday's incident, but set the facts of the case straight. I also refer you to the Serbian Football Association account, endorsed by the match officials. Just to be perfectly clear: the NYT - and other media - is busily spinning this as yet another manifestation of "Serb bigotry" against the poor innocent Albanians. Imagine, the Albanian fans were "barred from the stadium"! Serbian fans were likewise banned from the upcoming game in Albania - for the same reason, security fears - but there is no mention of that, of course. It would spoil the "Serbs bad" narrative. The "nationalist Albanian flag" was in fact a banner depicting the so-called "Natural Albania," the objective of Albanian chauvinists since 1878 or so, for which they have repeatedly enlisted support of outside conquerors (Austria-Hungary, Nazi Germany, NATO). Of course, Albanians and their Western sponsors are shrugging this off as "Serbian propaganda" or paranoia - even as the US "diplomat" involved in staging NATO's 1999 casus belli openly endorses the project. And let's by all means talk about that particular elephant in the room. Fifteen years ago, NATO attacked Serbia in support of an Albanian terrorist insurgency, occupied a part of Serbian territory (the province of Kosovo-Metohija) and had it declared an independent state (in 2008). Albania has backed the insurgency, the NATO war and the subsequent land grab all the way. Even though the quisling government of Serbia has nonetheless bent over backwards to properly host the Albanian team in Belgrade, the Albanians launched a drone with an incredibly offensive banner - and not just to Serbs, but also to Greeks, Montenegrins and Macedonians (all Empire's vassals, but I guess beneath Albanians on the ladder so their interests don't matter?). They have tried to profit from the resulting interruption, bragged about it on social media (the US standard of truthiness, per J. Psaki), Albanian officials congratulated them for a "job well done" and called the whole thing a "splendid subtle provocation". And this is somehow Serbia's fault? To hear the Western media tell it, the sight of an Albanian flag sent Serbs into paroxysms of rage at a soccer (football, in the non-US world) match with Albania yesterday, and the game was called off amid the riot. Here is what actually happened: a drone (!) with a banner depicting the Nazi-allied "Greater Albania" flew onto the pitch. The British referee halted the game. 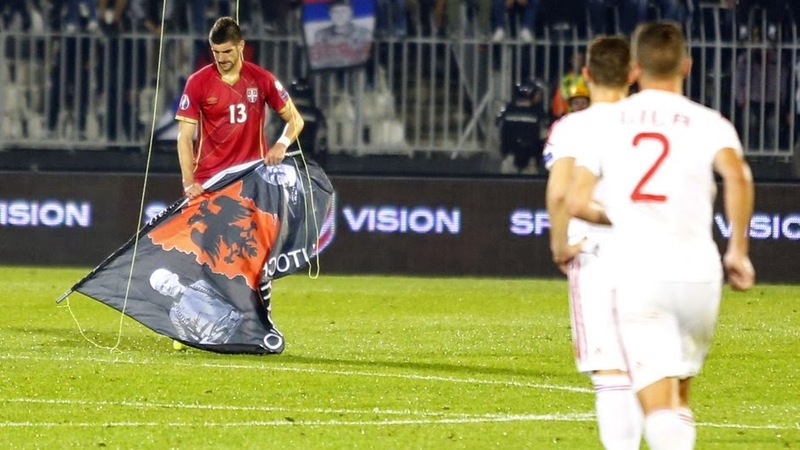 A Serbian player grabbed the banner and began to fold it, whereupon the Albanian players attacked him. Outraged Serbian fans began throwing objects onto the pitch. Both the Serbian players and the police then shielded the Albanians and escorted them off the field until the disruption was sorted out. After the Albanians refused every reasonable offer to continue or reschedule the match, the game was abandoned. I have already written about some incongruities in the campaign preceding the Bosnian general elections, scheduled for next weekend, but there is one thing I left out, as it deserved a post of its own. 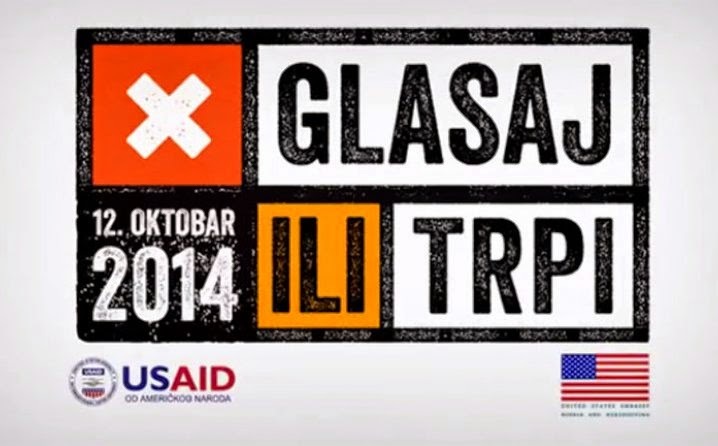 Local TV stations aired two ads in the third and fourth week of September, produced by USAID - the Empire's "Agency for International Development." Both had the punchline "Vote or Suffer" (Glasaj ili trpi). Still from the USAID propaganda video - "Vote or Suffer"
The first ad (watch on YouTube) blames the Bosnian authorities for failing to help the victims of May and August floods (!). On the same day it aired, the Imperial embassy website published a blog post co-authored by the military attache and the USAID head of mission, which accused the Bosnian authorities of embezzling the flood aid funds! Both the Serb Republic and Federation authorities responded right away that the Empire was flat-out lying: they couldn't have embezzled anything, as not a penny of the promised flood aid from the US and the EU had actually arrived. But the Imperial officials refused to retract their claims. A few days later, another ad appeared, this time criticizing the economic situation (watch on YouTube). There is no question that Bosnia is in a dire economic predicament, but a great deal of blame for that lies in the absurd legislation the locals outright copied from the US and the EU, under constant pressure from Washington and Brussels. One example is a 2009 law on "animal rights" which turned the Sarajevo Canton into a free range for feral dogs. Let's also remember that US and EU officials supported the "demonstrators" with supposedly economic and democratic grievances, who earlier this year torched government offices in Sarajevo, Zenica and Tuzla, Maidan-style. Lest you think this is someone impersonating USAID on YouTube, you can see both videos featured on the agency's official website. The claim by the agency head and Embassy officials that this is purely a "get out the vote" campaign is absurd. The ads very specifically urge the voters to elect a different government - presumably one more willing to obey orders from Washington. More to the point, USAID is engaging in behavior that would be blatantly illegal in America itself. Imagine a foreign agency running TV ads urging Americans to "vote or suffer"! This is but the latest in a series of attempts by the Empire to influence the outcome of Bosnian elections. Imperial officials have turned a blind eye to jihadist activity (even when directed against the US!) 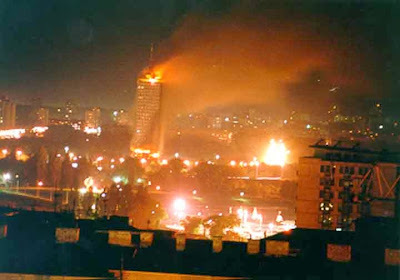 in Bosnia for years, backed the rioters who torched government offices in February, sent in additional troops as a way of signaling support to those they back and threaten those they oppose, and outright "midwifed" the opposition coalition in the Serb Republic, recycling a name of a previous creation in the process. Thanks to genuine activists on the ground, their interference has been documented and brought to light. Keep that in mind when Empire's stooges begin crying foul, after they lose at the polls. A satirical German TV show "Die Anstalt" (The Institution) has aired a segment on September 25 mocking the Western coverage of the conflict in the Ukraine. General elections in Bosnia-Herzegovina will be held on October 12. The date was originally supposed to be October 5, but the whole thing was postponed by a week at the insistence of the Muslims, because October 4 is Eid-al-Adha. In the Serb Republic (Република Српска), the contest will be between the ruling coalition - led by Milorad Dodik - and the opposition alliance slapped together by the Empire. Ironically, the opposition's mainstay is the Serb Democratic Party (SDS), once led by Radovan Karadžić (now before the Hague Inquisition on charges of "genocide") and demonized by both the Empire and its Muslim clients. Is Washington hoping to replicate the 2012 Serbian scenario? If so, the effort is as lazy as it is transparent: the opposition calls itself the "Alliance for Change" - the same name as a contradictory coalition the US had created back in 2000, only in the Muslim-Croat Federacija. The original "Alliance for Change" ended up being an abusive marriage of (in)convenience, in which the Social-Democrats were constantly undermined by the Party for Bosnia, a splinter of the Islamist SDA (Alija Izetbegović's Orwellian-named "Party of Democratic Action"). A decade later, the Social-Democrats got to try again; this time they chose to ally with the SDA and fringe Croat groups. After the SDA's sudden but inevitable betrayal, they tried a pact with another splinter party: Better Future Alliance (SBB), run by the shady media magnate and ex-SDA propaganda chief Fahrudin Radončić. That too ended badly, surprising precisely no one. Properly explaining the dynamics of Bosnian Muslim politics would take years; suffice to say that the momentum currently seems to favor the SDA. Its chairman, Sulejman Tihić, died of cancer last week; the funeral rites were an occasion for much rhapsodizing and rallying around Tihić's longtime rival Bakir Izetbegović (yes, Son Of), who has now taken over the party and is running for re-election in the country's three-member Presidency. The SDA is also sure to get a last-minute boost from the Islamic clergy, during the Eid festivities. It's a year for plagiarism in Bosnia, it seems. First the Empire "recycles" the name it used 14 years ago in the Federation for the political group it's now backing in the Serb Republic. 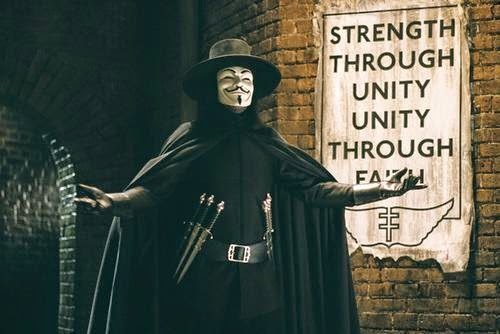 Then the SDA runs on a fascist slogan from a Wachowski movie. But wait, there's more: the former chief mufti, Мustafa Cerić - now a private citizen running for the Presidency - outright plagiarized not one, but two Western designs: the logo of a Las Vegas casino, and that of the Virginia Mennonite Conference (!). Meanwhile, the politics of hatred and mistrust remain unchanged. There is a thick fog of disinformation out there concerning this "Islamic State", ISIS, ISIL, Caliphate, or whatever it is. A week ago, we had to suffer through the Emperor personally chairing the UN Security Council meeting on the greatest-ever-threat of Islamic-but-unrelated-to-Islam terrorism, complete with calls for criminalizing volunteers who fight in foreign wars - so long as they fight against the Empire, anyway. Empire's proxies, clients and quislings are obviously exempt. Yet it should be intuitively obvious to the casual observer that ISIS arose from the fertile soil of Imperial support for a rebellion in Syria against the Assad government, launched back in 2011. For all the talk of "moderates" and "democrats for human rights," it was the jihadists who had the will and skill to use those planeloads of arms the Empire provided via Croatia and Jordan. 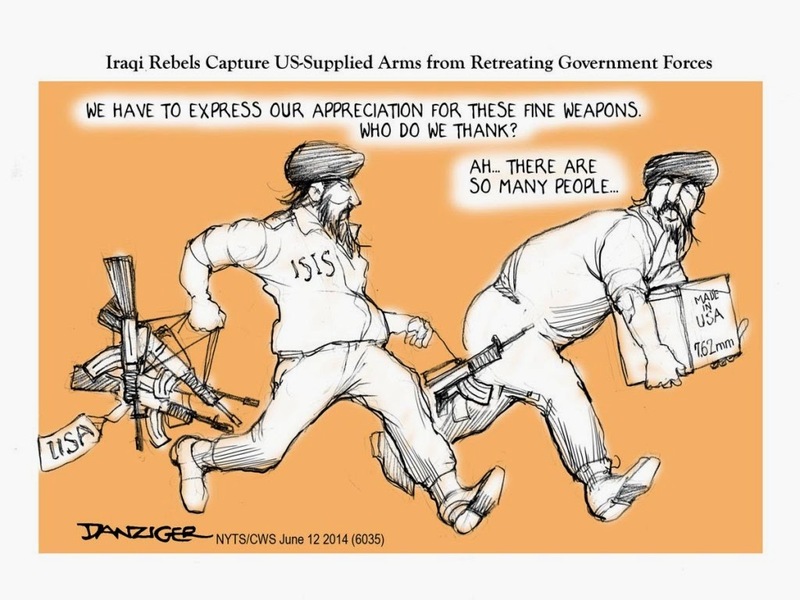 There are even some who claim that the Imperial government created ISIS deliberately. If true, it wouldn't be the first time: Zbigniew Brzezinski boasted of setting off the Afghan jihad in order to provoke a Soviet intervention. But I am loath to give the Imperial government any more credit than it actually deserves. Having witnesses its appalling incompetence in a range of affairs on a daily basis, why would anyone believe it is somehow a genius international manipulator? More likely, this is all perception management again. ISIS arose from the idiotic policy of backing the jihadists in Syria (and in general), but hey - we can spin it as a retroactive justification of the Iraq invasion, and a fresh new terrorist threat that will justify new strip-searches and snooping while making Barack the Blessed look more presidential. A win-win! Spin, that's how all of this works. On one hand, acts of puppetry like the Kiev coup or the Hong Kong protests are presented as "spontaneous", while on the other hand, genuine disasters, blowbacks and fiascoes stemming from Empire's ignorant belligerence are spun as parts of some brilliant grand strategy - thus furthering the illusion that the Atlantic Empire is all-powerful, all-knowing and all-competent, though in reality it is none of those things.